Co-working is so many things. Co-working is about cool entrepreneurs and freelance professionals working together and sharing world class office facilities. 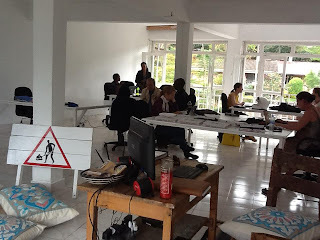 Co-working is about joining a community with shared values that innovates and grows together. And, co-working is about enabling entrepreneurship and innovation. Our initial membership includes an awesome tech company, HeHe Ltd; a top local accounting and auditing firm, FAST Global; a tech support group managed by a well-known Kigali DJ; a really talented graphic designer, Union Multimedia; a web designer that created the popular Living in Kigali website; a creative outreach officer for the Museum of Photographic Arts in San Diego; a very experienced financial literacy consultant; and a great general contractor. In other words, our initial membership already constitutes a complete entrepreneurial and creative ecosystem. Moreover, only two weeks after our trial opening we’ve recorded several instances of collaboration. Several Office(r)s have hired other members for work and have referred each other to paying clients through their network of contacts.